Since Edwin Hubble introduced his famous tuning fork diagram more than 70 years ago, spiral galaxies and early-type galaxies have been regarded as being two distinct families. The spirals are characterized by the presence of disks of stars and gas in rapid rotation, while the early-types are gas poor and described as spheroidal systems, with less rotation and often non-axisymmetric shapes. This clear distinction is emphasized in Hubble’s tuning-fork diagram (Figure 1 left), where early-type galaxies (E0-E7 and S0) lie on the handle of the fork, well separated from spiral galaxies (Sa-Sc). The separation is physically relevant as it implies a distinct path of formation for the two classes of objects. Figure 1. Comparison between the classic tuning-fork classification scheme (left) by Hubble (1935) and the new comb diagram (right) proposed by the ATLAS3D team [ PNG ]. A known issue of Hubble’s classification, however, is that it mostly relies on optical images, from which it is nearly impossible to recognize thin face-on disks of stars from much rounder edge-on spheroids. For this reason the fraction of disks-like systems hidden in the early-type category has been a matter of debate for decades. The solution to the problem comes from observations of the stellar kinematics: the stars in a thin disk rotate much faster than those in a rounder spheroid. This implies that the kinematics makes it possible to recognize a disk from a spheroid at any inclination. However it requires complex and time-consuming observations. To obtain these observations, the ATLAS3D team was created: a collaboration of about 25 astrophysicists from 6 countries in Europe and North America, led by Michele Cappellari (Oxford, UK), Eric Emsellem, Davor Krajnovic (ESO, Germany) and Richard McDermid (Gemini, USA). Thanks to the major allocation of 40 nights of observations with the SAURON integral-field spectrograph at the William Herschel Telescope, the team derived maps of the stellar motions (Figure 2) for all 260 galaxies in a carefully selected volume of the nearby Universe. The results were unexpected and reveal a new paradigm for early-type galaxies. For the first time, it was found that the overwhelming majority of the early-type galaxies in the nearby Universe does not consist of roundish spheroidal objects, but instead has disks and mostly resembles spiral galaxies with the gas and dust removed. Only a tiny fraction of the early-type galaxies – the “slow rotators” – are genuine spheroids. This indicates that Hubble’s classic tuning-fork gives a misleading description of galaxy structure. To correct for this fact the team proposed a revised scheme in which the vast majority of early-type galaxies – termed “fast-rotators” – are close relatives of spiral galaxies (Sa-Sc) and for this reason form a parallel sequence to them (Figure 1 right). The new paradigm highlights a much closer connection between early-type and spiral galaxies than previously thought, and this will need to be considered in future models of how galaxies form. The above results were presented in three ATLAS3D team papers lead by Cappellari, Emsellem and Krajnovic respectively, which will appear this month on the journal Monthly Notices of the Royal Astronomical Society. Figure 2. 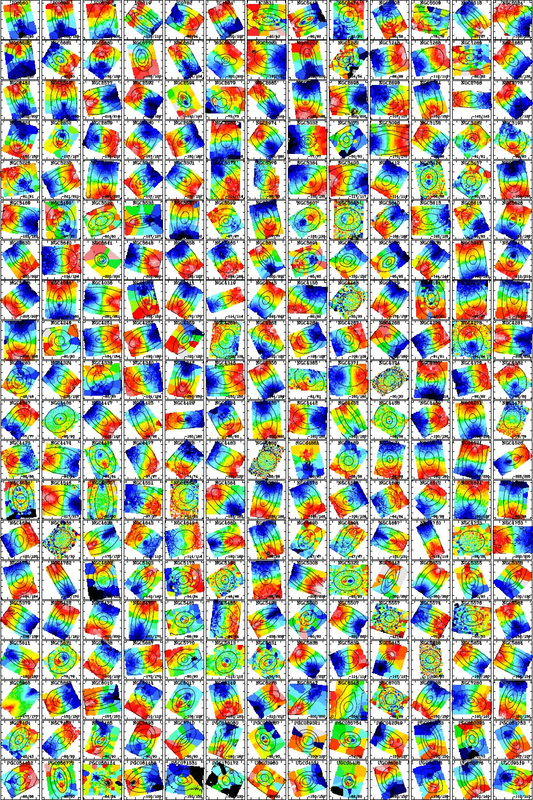 Maps of the observed velocity of the stars in the volume-limited sample of 260 early-type galaxies of the ATLAS3D survey. Red/blue colours indicate stars moving away/towards us respectively. Fast rotating and disk-like galaxies are characterized by two large and symmetric red/blue peaks at the two sides of the centre. This figure shows that this class of objects constitutes the vast majority of the sample [ PNG ]. Introduction to the ATLAS3D project: Cappellari et al. (2011, MNRAS, 413, 813). The kinematic classification of galaxies: Krajnovic et al. (2011, MNRAS, in press), and Emsellem et al. (2011, MNRAS, 414, 888). The comb classification diagram: Cappellari et al. (2011, MNRAS, in press). 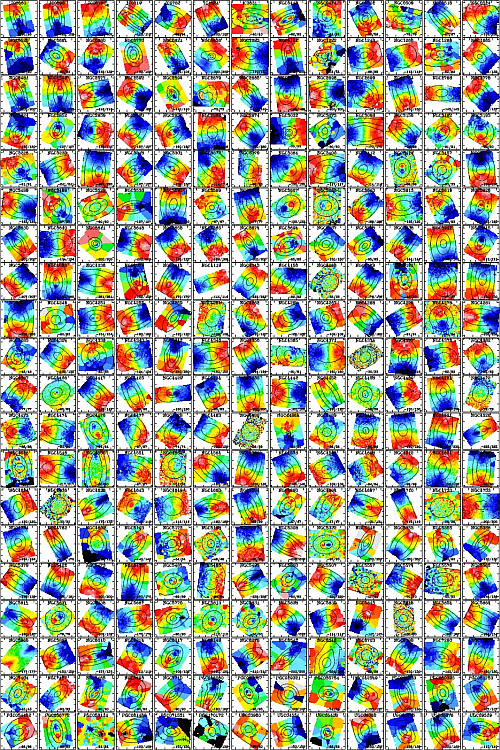 The project website, including the full list of ATLAS3D papers, published data, and details on observations at other wavelengths: http://purl.org/atlas3d. Katey Alatalo (UC Berkeley, USA), Leo Blitz (UC Berkeley, USA), Maxime Bois (Observatoire de Lyon, France), Frederic Bournaud (CEA, Paris-Saclay, France), Martin Bureau (University of Oxford, UK), Michele Cappellari (University of Oxford, UK), Roger L. Davies (University of Oxford, UK), Timothy A. Davis (University of Oxford, UK), P. T. de Zeeuw (ESO, Garching, Germany; Leiden University, The Netherlands), Pierre-Alain Duc (Laboratoire AIM, Paris-Saclay, France), Eric Emsellem (ESO, Garching, Germany; Observatoire de Lyon, France), Sadegh Khochfar (MPE, Garching, Germany), Davor Krajnovic (ESO, Garching, Germany), Harald Kuntschner (ESO, Garching, Germany), Pierre-Yves Lablanche (Observatoire de Lyon, France), Richard M. McDermid (Gemini Observatory, Hilo, USA), Raffaella Morganti (ASTRON, Groningen University, The Netherlands), Thorsten Naab (MPIA, Garching, Germany), Tom Oosterloo (ASTRON, Groningen University, The Netherlands), Marc Sarzi (University of Hertfordshire, UK), Nicholas Scott (University of Oxford, UK), Paolo Serra (ASTRON, Dwingeloo, The Netherlands), A. Weijmans (Dunlap Inst., Univ. of Toronto, Canada), Lisa M. Young (New Mexico Tech, Socorro, USA).